Too many choices? 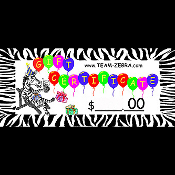 A TEAM-ZEBRA gift certificate is the perfect solution! Let your recipient choose from hundreds of unique funky earrings and costume jewelry selections in our online store! Great to present as teacher, coach, student and player awards... They are also perfect extra holiday gift add-ons, as well as Secret Santa! Larger certificate dollar amounts allow your chosen giftee to have a single shopping spree, or multiply the fun over several smaller purchases, making your gift last even longer! TEAM-ZEBRA will send this Gift Certificate to your intended gift recipient's email address, along with a PASSWORD of your choosing, on the date you request, or within TWO (2) business days of your cleared payment. To redeem the gift certificate, the recipient simply signs into our online store through TEAM-ZEBRA's website using the email address and password you provided. The full gift amount will automatically be credited to their newly-created account, or added to a previously registered account. This Gift Certificate is valid and redeemable only at TEAM-ZEBRA's online store, for total purchase including shipping charges and any applicable sales tax. Any amount remaining after a purchase will remain credited to the account, so it may be used on future purchases. If the purchase exceeds the the gift amount credited, the balance due may be paid via PayPal or credit card. If you include your email address, we will also send you a COPY (cc:) of the gift certificate email at the time it is sent. If you prefer to deliver the gift certificate personally, simply enter your own name and email address in the Gift Recipient information spaces. You may then print a copy of the emailed certificate to give. *YOUR name and email address. *Gift Recipient's NAME, complete postal ADDRESS, and eMAIL address. *Requested DATE to send the email, if desired. If no date is given, it will be sent within TWO (2) business days of receipt of completed payment. *A special note or message from you to the Gift Recipient, if desired. Gift Certificates cannot be redeemed for cash, and are not refundable. -Gift Certificates cannot be combined with other offers. -Buyers may NOT use discounts or promotional offers to purchase gift certificates. -However, Gift Recipients are WELCOME to use their gift certificate in combination with a coupon code discount, combined shipping discount, or wholesale discount!